The 2nd Thursday of Jazz Fest (the highlight of that day being Solomen Burke), Beau and I were cutting between the Congo Arts area and way over to the side, sitting on a fence post all by itself, was this small childs hat. The hat showed no signs of wear, so my guess was it came out of someones bag in transit between one area and another. We passed by again several hours later and the hat was still there. So, added it to my bag and brought it on home, where I washed it and sat it on my side table to decide how to decorate it for my grandgirl, Lilly. 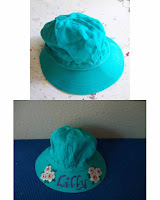 -- Ironed them onto the hat. Hopefully she'll be coming to visit next weekend and I'll give to her and get a picture of her modelling. (( Did I mention that I love Lilly )). This is such a cute idea. I may have to try this for my nieces!